It’s the first thing they say to you when you arrive. Yeah, it sounds kind of creepy and I knew in advance that this would be the greeting, but in context and after a rather arduous four days getting there, I received it as a warm and comforting greeting. The hug helped. If you don’t know what I’m talking about, you have never been to Burning Man. It was dirty. It was dusty. Every day the sun would be blotted out by the talc like dust from the wind coming up in the afternoon. Dust in your nose, your mouth, your hair, your food–everywhere. Nice RV’s and campers give a little relief to those who have them, but nothing can stop it completely. My beloved and I slept in a very nice tent, but after two days and our best efforts to keep it clean, the interior was covered in dust as well. In spite of the dirt and the difficulty of just getting there, I found the experience to be singularly astonishing. It was in many ways very much as I expected. The camps, the port-a-potties, the naked guys on bicycles, the art cars, the art itself–all of these things were unsurprising. But a superficial survey of the day to day experience cannot account for the barely discernible and inscrutable essence that accumulates over time. It is the sensitivity to this that determines whether you’re a “Burner” or a guest. Burning Man has a taste: it’s the umami of social experiments. In a voice memo recently I remarked that it made no sense to say “I’m grateful for this life” or “I am happy to be alive.” My thought was that such statements end up being nonsense. I think the problem comes down to counterfactuals. Being ungrateful that I wasn’t born rich or being grateful that I wasn’t born with a crippling disease is a form of reflexive reflection. It entails entertaining the possibility that the “I” in the statement could have been something else, which is not even logically possible. The subject that makes such a statement could not under any condition be different than it is at that or any moment in its existence. I find this interesting because there is a great deal of utility in this faculty of the mind. It is the basis of empathy, for example. That we can imagine being “in someone else’s shoes” helps us to connect and exist as social creatures. It’s odd that this ability is based on a deep fallacy. A few weeks ago I had an opportunity to attend a Japanese flower arrangement class. The art form has flourished in Japan since the 6th century where it was introduced or invented by Buddhist monks. 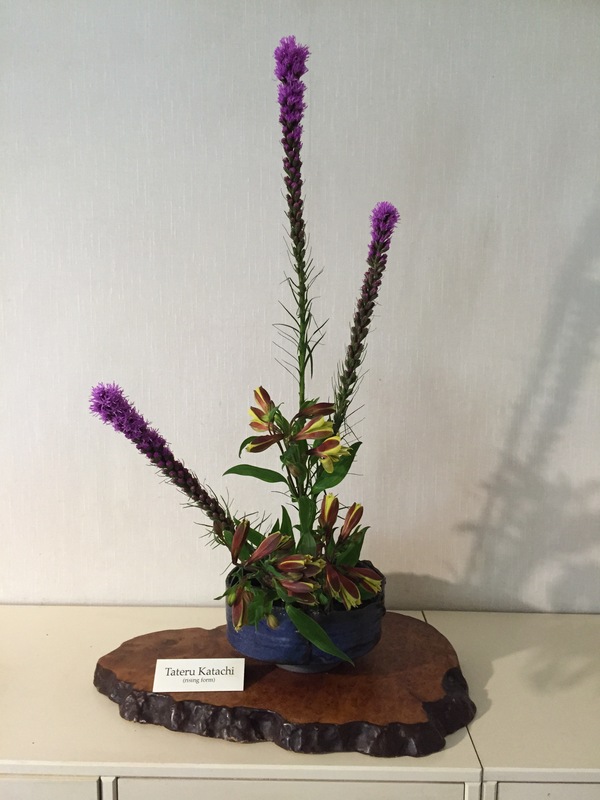 Ikebana has many schools, but all of them rely on a formalist framework. Forms are defined and rigidly adhered to. Even “free form” arrangements are mash ups of accepted forms. It can be argued that formalism is a rather arbitrary way to determine what is beautiful. If the Golden Mean was a brute force definition of what is beautiful, ikebana is an elaboration of this principle of balance and thematic cohesion. But who decides what forms are beautiful, and what makes a particular set of proportions, relations or settings more pleasing than another? Music is the best clue to the solution of this problem. Auditory phenomena that qualify as music are fairly universal. There are cultural variations of course, but the basics of tonality, timbre, rhythm and harmony can be found in music anywhere. We know the difference immediately between noise and music (with the notable exception of composers who knowingly blur the lines such as John Cage). But even in the case of Cage, one cannot understand or appreciate his innovations without first acknowledging the formal structure that he was intent on breaking. The phenomenology of beauty is a fascinating topic worth exploring in more detail at some point. In short my take on it is that human beings are hard wired with some good useful short cuts that help us interpret the raw phenomena of being in the world. Some rule based cues from the environment and good adaptive experience lock us into a circumscribed world of aesthetically pleasing relations between sounds, shapes and colors. As a young artist, my idea of formalism had more to do with tradition than theory. I had never heard of Clive Bell, let alone Kantian aesthetics. “Form” was something you learned in art school and I wasn’t interested in that. This misunderstanding of formalism as an aesthetic idea combined with my prejudice against certain styles of art, left me handicapped from self-inflicted wounds. My introduction to Japanese flower arrangement alerted me quite unexpectedly to this blind spot. The lesson was straightforward. The instructor gave us a piece of paper with the form we would be using that day: Tateru Katachi (rising form). It included a subject, an object and a region of space (shown as a dotted line shaped like a beehive on the diagram). The form was three dimensional of course so it was confusing to try and visualize what the little diagram meant. Our instructor provided some cryptic tips, but after a while I got a sense of what was going on. It all seemed easy enough: The subject is at the center in this form. The object moves away from the subject on the same vertical plane but thrusts outward on the horizontal. The rest of the arrangement uses additional elements (other flowers and greenery) to compose a balanced piece that brakes up the different planes in all three dimensions without piercing the beehive shaped imaginary space. (At right is my finished product. We got one practice attempt, and then one more try). After the lesson I became aware of the value of taking some kind of formalism in composition more seriously than I have in the past. It’s not that I have not been aware of the importance of composition and relations in my work–I take that very seriously. But it has never been something that I thought about a great deal in preparation for a piece. The lesson made me realize that I was unnecessarily leaving a great deal of the composition to luck. There will always be a huge element of accident in any piece of mine no matter what I do. But by taking a formalist approach in terms of the most general primary and secondary elements in a more conscious way, I think the work may be less stressful and more aesthetically pleasing. And the give and take between what is necessary (the formal) and what is expressed within that imaginary space may make the process much more enjoyable. Maybe painting doesn’t have to be a battle but rather a series of small skirmishes on a clearly defined field. Is this the end of the Lesser of Two Evils argument? It’s a great time to start talking to your relatives and friends about the fallacious argument referenced above that we are subjected to on a quadrennial basis. The girlfriend remains convinced that Hillary & Trump secretly conspired to secure their respective nominations. Davidly recently had a very amusing post fantasizing about the prospect that this is all a giant hoax perpetrated by the greatest comic genius of all time, who is not in fact dead… (Read it for yourself). It is a mind boggling event worthy of the Situationists. It is a glorious black swan that will destroy the American political system. It is divine justice from the Almighty who is raising up the Bad King/Queen we deserve. The pundits are twisting themselves into knots trying to explain how this happened since none of them considered it a real possibility. I admit, I thought it pretty far fetched nine months ago. But I relished the prospect of Trump running amok for a few months. I did not, however, vote for him when the opportunity came (I registered Republican this year so I could participate in their closed primary–this was before Bernie made the scene). The democrats should be very careful about counting any Hillary chickens before November. The general election has the largest turnout, and believe it or not there are probably tens of millions of people here in the USofA who will vote in November and currently have no idea what is going on in the primaries. I can see Trump winning. In fact, strange as it may seem, my own rather rebellious (politically) teenage daughter, who turns 18 in August, told me a while ago that if Bernie isn’t on the ballot, she will vote for Trump. Yes, that is bizarre, but to an idealistic and naive teenager, a vote for either of them is a vote against a fucked up state of affairs that has made my little millenial daughter into a very cynical person. Anyway, back to the original question: How can Hillary be the lesser evil over Trump or vice versa? It’s a paradox worthy of Xeno. Roll that around in your mind for a while and prepare to get dizzy. Use this trick to convince as many people as possible that there are other options. This could be a banner year for third party and write-in candidates, which could be a silver lining to this weird, gloomy end-of-times cloud that hangs over the nation.